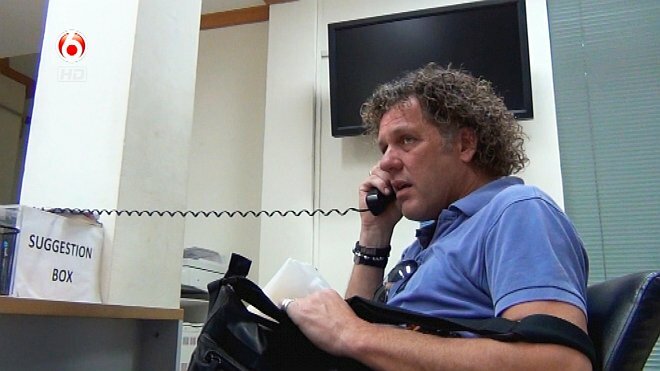 Dutch TV host and travel scam expert on jewelry scams, death threats and being held hostage in massage parlors. I need a dollar, a dollar, a dollar is what I need – Aloe Blacc’s hit single of 2010 serves as the ultra-suitable intro song to each episode of Oplichters in Het Buitenland, a Dutch TV show that reaches almost one million viewers in a country of only 17 million people. Why suitable? Because Oplichters in Het Buitenland translates into English as Scammers Abroad. And the Dutch TV show that started airing on the SBS 6 network in 2013 has only one concern: exposing the anatomy of travel scams as you can find them in every major city on the planet. Scammers? Abroad? You Don’t Say! a TV crew interviews a travel scam victim, tries to hunt down the scammers and eventually demands reimbursement or complains about the local police not doing anything about the obvious crime. The way Oplichters in Het Buitenland does it, however, is completely different. Oplichters in Het Buitenland is written and directed by TV journalist and self-taught travel scam expert Kees Van Der Spek. The tall and well-built dutchman, look-wise an almost Doppelganger to actor John C. Reilly (Thin Red Line), looks like the last person to fall victim to a crime, let alone a travel scam. Yet this is exactly what Kees does. In every episode of the show Kees flies to out to cities all across the globe and voluntarily falls victim to all kinds of local scams. underneath his shirt and a camera hidden inside his bag Kees seeks out those types of people that you and me would not give the time of the day. In his role as the perfect victim Kees plays the tourist looking to change money, or he goes for drinks with random women approaching him in the streets. This deocy approach is the special sauce of Oplichters in Het Buitenland. 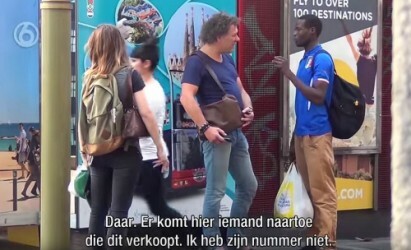 While Kees plays along with the scammers the viewer sees and hears it all: the scammers’ faces while they lie, their voices when they make threats – you feel like you are right next to the “action”. How does one come up with the idea of getting scammed voluntarily, filming the whole thing on top of it? And doesn’t it get dangerous if you get exposed as the exposer? In our interview we ask Kees about the concept behind Oplichters in Het Buitenland as well as the most dangerous situations he been in so far. Kees, how does one get into the business of exposing travel scams? The idea came to me 11 years ago. I was traveling to Bangkok, Thailand with a friend and we got scammed big time. I already worked for a TV station back then so I suggested the idea to my boss: I would fall for the same travel scam again, only this time deliberately, filming everything. My boss loved the idea and I was allowed to shoot a pilot for a series that was very successful. That’s how the concept was born. Wait a minute, you were scammed? How could that ever happen? I was an ignorant tourist and trusted everybody! (laughs). They got me with the “tuk-tuk jewelry scam”. 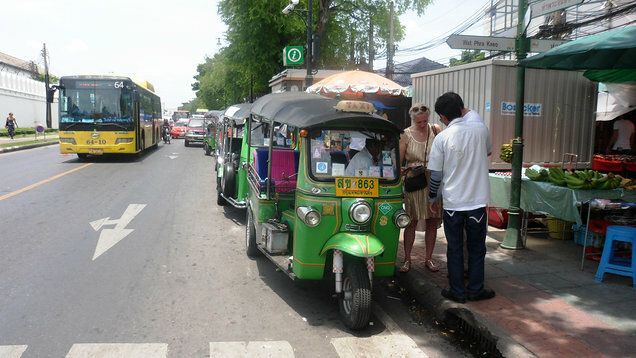 This one starts off with a cheap city tour on one of the tuk-tuks [3-wheeled rickshaw cars, ed.]. During the tour they took me to what they called the “Lucky Buddha” temple. This temple is of course fake and part of the scam. As soon as you leave the temple you will be approached by people telling you about an opportunity: just this week – which always happens to be the week you are around – there will be a special jewelry sale in “government stores” where diamonds and sapphires are sold tax-free. The “government stores” are regular jewelry stores, and whatever you buy there will only be worth half of what you pay for. That’s how I got scammed and lost a lot of money. I have to say, though, that we got all of our money back later. We complained to the police about the scam who happened to do a raid on the “government stores” a couple of days later. In Thailand it is not uncommon for scammers to claim that they are “government”, they go as far as dressing up as policemen in order to scam people. Watching Oplichters in Het Buitenland can be brutal. — Do you have to be masochist to do this over and over again? What I do is produce a TV show. Scammers may think they are luring me in, but in reality I am luring them in. Of course, I am playing the naive tourist and the “victim”. But remember, this is for a TV show. I am professional about it. We film them with two cameras that they have no idea about, and later we expose them. The role that I play is just how investigative journalism works: you go in and investigate. And that’s exactly what I do, I am giving viewers a look behind the scenes that they would never have if it wasn’t for me. Personally I couldn’t think of a better way to warn people than having someone go all the way with the scammers. We are showing what the scammers look like, how far they will go, how they really operate. That way people know what to expect and how to protect themselves when they are at their destination. And technically? What is your schedule for filming? Are you deciding where to go by your gut-feeling alone? Every episode is about one country. Oplichters in Het Buitenland now has 26 episodes on 26 different destinations. We are entering our 5th season that will start screening in February, 2017. Every trip to a destination lasts about 9 days, followed by 6 days of editing. As you can see in the episodes we don’t just show travel scams. We also show the scenery, the nice and pleasant side of the city. In that sense, I show the beauty – and the beast. All in all we have 6 months to shoot 6 episodes, so we have one month for each of them. What research do you do? How do you find out about travel scams in the first place? For every episode we do thorough research. Our most valuable resource these days is the internet. We through all relevant websites and forums, screening for places and names that come up repeatedly. Then we talk to the victims of scams, too. They have been through what we are looking to uncover so talking and interviewing them about their experience helps a lot. When we go to a destination we travel as tourists exclusively. No business visas, no press cards – nothing. As tourists, we fly below the radar, a customs officer discovering one of the hidden cameras we have installed in our bags would be a full catastrophe. When we are shooting it is me, wired-up with a microfone and the hidden camera inside my bag while mareijke, my assistant, films me from a distance, acting like a tourist who would be filming the scenerey. Our second camera man – he is doing the scenery shots for the episodes – acts as mareijke’s boyfriend while we are out filming. Both of them act like they don’t know me. That way we are totally inconspicous. Unless you knew what was going on, you could never tell what we are really doing. We work fully “undercover”. This is also the reason why we never-ever fake anything on Oplichters in Het Buitenland. Everything is real and unedited, because the scammers do not even know they are filmed. I show the beauty – and the beast. They don’t realize they are filmed, but you still get into quarrels, arguments, even fights all the time. — What is the most dangerous episode you have filmed so far? That would have been Istanbul. Or, even worse, Shanghai. In Shanghai massage parlors are the number one place to be scammed. Scams in Shanghai are often related to prostitution where a regular massage is “extended” through sexual services. The victim is then threatened with the corrupt Chinese police as prostitution is illegal in China. For me, it was extremely hard to convince the massage lady that I had no interest in her sexual favors. You can see that very clearly in the video. No matter what I said, she wouldn’t stop trying to force herself on me, touching me everywhere. She had to! With no “lewd act” taking place they would not be able to scam me. Then another girl joined in, and I was trying to fight back two girls forcing themselves on me. In the end nothing happened. But that did not keep them from scamming me. The manager came and pressured me hard. He wanted the full 2300€, the absolute maximum of what my credit card could take. Do you realize how ruthless they were? 2300€ — for 15 minutes in a lousy massage salon. As you can see in the episode the atmosphere was really heated. In the conversation the manager and his assistant threated to kill me like what, 12 times? And I was in a really bad situation: since it was a massage I had to take off my wire. That way no one from my team on the outside could hear what was going on inside. I was completely cut off from the outside world, armed only with the hidden camera inside my bag. And if they had discovered that, things could have gotten much worse. Could it really? I mean these people have no interest in hurting you. They have an interest in your money. Oh it could, trust me. Did you see the episode on Tokyo? I tried to help a Swedish tourist who fell for one of the local nightclub scams. The venue was operated by the Yakuza, the Japanese mafia. So as I am trying to help the Swede one Yakuza member starts kicking me! Things can get really dangerous and that really fast. In Malaysia I went to a bar with two women who spiked my drink. They must have been doing this for a long time, Mareijke and I didn’t even see when they did it. At some point I just began to feel very drowzey and realized I had to get out of there as soon as possible. It was only later when we were looking at the footage in slow motion that we saw how they roofied me. One of the girls got a pill out of her purse. She opened it and poured the content into her own bottle of beer. Then she swapped her bottle with mine. Did you ever find out what was in that pill? That sounds risky. What happened later on? I had a good night’s sleep (laughs). When you went to Argentina something special happened. My Dutch wasn’t good enough so I didn’t understand everything watching the episode. What happened in Buenos Aires? Argentina’s economy is facing crisis after crisis. Inflation is heavy. To fight inflation the government tries to get as much stable foreign currency into the country as possible. They are looking to make money so as you can imagine, the exchange rate for your Euros is absolutely lousy. The rate is so bad, you would have to be crazy to change money with them. But changing money outside of the official agencies is illegal in Argentina. So what do the people do? They do it illegally. The black market for money exchange is booming in Argentina. The way they do it is very clever. When you go with one of the many guys in the street yelling “Cambio! Cambio!” they take you to a fake phone store. From the outside it looks as if they were selling iPhones. But in the inside the store is empty. It is an illegal money changing place! You can safely change your money there. No hassle, no scams and you will save a lot of money on top of it. The official rate is so bad that the illegals can offer you a rate that is 100% better than the official one. And they still make money of it for themselves. In the streets I was approached by the gambistas with the police standing next to us. That is because the police are on the scam. They receive money from the gambistas and turn a blind eye on the illegal exchange. Tourists, locals, gambistas, police: everybody wins. The government loses. Have scammers ever turned the tables on you, i.e. confronted you about filming them? The first one was in Bucharest where we discovered how the local taxis scam passengers. Taxis in Bucharest have what the drivers call a “monkey”, a hidden button on the driver’s seat that pushes up the meter! I got three taxi drivers to show me their monkeys, letting me film in detail where it was located, how they operate it, how the meter goes up every time they press it. Then all of a sudden another taxi driver steps in and hisses sharply at his colleagues: “What the f*** are you doing? He could be filming you!” – that’s how our look behind the scenes came to an end. The other occasion was in Paris, Europe’s scam city number one, if you ask me. The area around the Eiffel Tower is a scammer’s paradise: tourists everywhere, all of them careless. We were filming a group of men doing the shell game scam. With this scam, a little ball goes under one of three walnut shells. The victim bets money on the shell with the ball in it, and everything just looks too easy. The audience watchi is in on the scam, a member of the scammer group will be the first one to win all the time, showing bystanders how easy winning is. That way real vicitms can be drawn into the scam. So while I am filing one of them comes up to me. 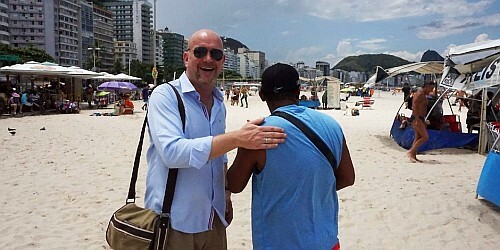 He points his finger directly at the hidden camera inside my bag: “You are filming me!“. A massive quarrell follows and we eventually have to stop filming. Here’s a different question: Are there any places you would not go to for travel scams? Mogadishu, Somalia. I’m pretty sure I wouldn’t go there. They probably don’t have many travel scams going on, either (laughs). Has it ever happened that you go somewhere – and then nothing happens? No scams, no cambistas – nothing? Only once and you will never guess where! For the 5th season of Oplichters we went to Barcelona. But when we got there – absolutely nothing. Mareijke and I were walking down Las Ramblas with our wallets and purse hanging out, and we weren’t pick-pocketed once. In the official pick-pocketing capital of Europe no pick pocket ever cared about us. Unbelievable. Then I started thinking: Barcelona has over 7 million visitors each year so our chances to get pick pocketed there must have been what, one in a million? Just when we were about to give up we saw something: police had just arrested a group of pick pockets right by the beach. They frisked them, took down their information and then released them. They were free to go. “That’s our chance,” I said to Mareijke. We got up and started following the pick pockets around. We got on the same subway asw them, we almost stalked them. In the end it took us two hours before they finally did something. When they took my wallet we could film everything. How they moved, how they grabbed the wallet, and how they quickly passed the wallet around. That way the thief can get arrested, but will face no consequences: he doesn’t have the wallet on him, how could he be charged? I hear a lot about you and “graves without a name”. What is the story behind that? What you mean is Graf Zonder Naam or Grave Without a Name in English. Grave Without a Name is a new show concept I developed. Here in Holland we have about 300 graves that have no name on them. An unknown person is buried there. Nobody really knows anything about them, who they were, what they did and why they died. It is all speculation as there are no papers and no passports. Here is an example: Let’s say there is a dead man who seems to be from Nigeria and the man supposedly died from a drug-overdose. The Dutch police have given up on the case and have informed the Nigerian embassy. The Nigerian embassy has little interest to solve mysteries and they close the case also. For them, a dead drug user is not important. The files go to the archive and the grave – has no name. This is where I come in. I do the work that police cannot do or that they don’t want to do. I get exclusive access to the files, and then I follow every trace, no matter how insignificant. I travel to all places and talk to all people. When I have solved a case the episode ends with me putting a name on a nameless grave. Don’t mean to flatter you, but this does seem like a unique concept. I couldn’t think of any other show that would be similar to this one. Grave Without a Name is a win-win for everybody: for the authorities, because there is one less unsolved cases and for the family of the dead person, of course. They find peace as they learn about the fate. This brings their worrying to an end. The good thing about Grave Without a Name is that the concept works in all other countries as well. Every country in the world has unsolved deaths. So you could easily start a similar show in another country and go by the same routine. We have done that with Oplichters in Het Buitenland: Endemol, the producer of the show [and one of biggest TV producers in Europe, ed.] has already sold the concept to the German Kabel1 network. In Germany, the show runs as “Achtung Abzocke” with host Peter Giesel doing my job. Last question: with all the fights and quarrels when you arefilming, what do you do when things get really dangerous? I pee in my pants (laughs). No, should things really get too dangerous then I can always pay and get out. Of course I am looking to push the situation also, but if it get’s too dangerous – I pay and it is over. No need to put myself at risk.